John & Rebecca joined the LDS Church on February 22nd, 1882. The were part of the Cedar Creek Branch and had been taught by Elders Robert Spence and Daniel R Bateman. Two years later in March 1884, the family emigrated to Colorado. John's parents had emigrated to Colorado in November 1883, and may have been influential in John and Rebecca's decision. Rebecca's father went along with them in 1884. Rebecca became ill during the trip. According to her daughter, Rebecca "took some kind of rheumatism and couldn’t walk. ... [She] had to be carried on and off the train. She was not able to do any work for about six weeks." In Colorado, Rebecca did find work spinning and carding wool. John found work clearing land. The family lived in a tent until they saved enough money to buy some horses which John used to haul logs from the mountains to build a home. While in Colorado there were three more children born to them: Robert, Alma, & Laura. In about 1892, with an idea to improve their situation, they decided to move to newly opened land in "Indian Country" The family made their way by train to Joplin, Missouri. From there I'm not sure where they went. One family story says John pawned some possessions to get by and was able to find enough work to buy them back. Their stay in that area, however, was short lived. By 1894, when Dora was born, they are again living in Tennessee. Back in Tennessee, John is rebaptized in 1897. For this reason alone John's name appears in the MTBR*. While I have records showing his original baptism in 1882, in the age before electronic records, not having access to the original baptism record may have been enough of a reason for local authorities to redo the ordinance. His wife, however, does not appear have been rebaptized. I can think of a couple reasons for this, from her poor health to her having no interest. I do know her health deteriorated, though I not sure when. She came down with tuberculosis and the humid Tennessee air was considered a problem. So in 1908 (Dora says she was 14 at the time) the family returned to Colorado where the dryer air would possibly help out. They may have had relatives there and could find a way to live. I'm not sure if the whole family went or if it was just Rebecca and Dora. It did not last long, however. By 1910 they all are back in Tennessee. The reason for this last return to Tennessee was described Dora as "she became dissatisfied" meaning her mother. Dora's choice of the word dissatisfied is interesting. It is a word Mormons often associate with being dissatisfied with the Church. However, I don't know that we can make that unqualified assumption. To decide dissatisfied meant disaffection we need more. Ultimately Rebecca did not get better. In April 1911 she died in Wayne County, Tennessee, probably from tuberculosis. Although I have found no proof of the cause of death, TB is a reasonable assumption. John remarried in 1917 to Mary Mayberry. He died a few years later in 1928 in Perry County, Tennessee. The Denton family constantly struggled with poverty. A lack of education or job skills left them searching to improve their situation, often by move. For this reason I believe their moves were not motivated by a disaffection with the LDS Church, even when considered with Dora's use of the word dissatisfied to describe her mother. While it could describe her relationship with the church it could also describe her hatred of Colorado weather. In addition, many of the children and grandchildren of this couple continued to get baptized, and receive temple ordinances. Had the family decided to leave the church a legacy of multi generational membership would have been unlikely. 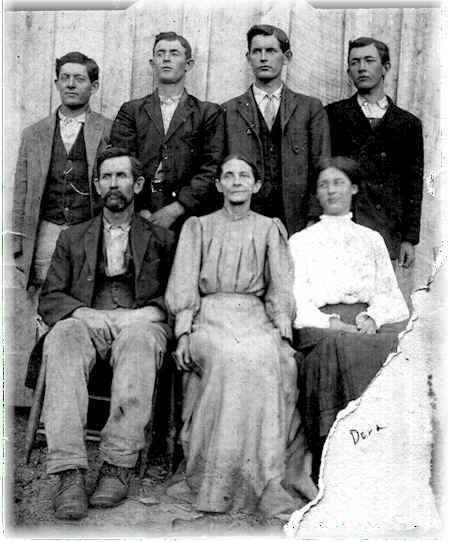 * The Middle Tennessee Baptismal Record or MTBR is my source for converts who went west but later returned to Tennessee.The record contain converts mostly between 1894 and 1920 with a few earlier than that. About 1411 baptisms are recorded with a small number of them being returnees.